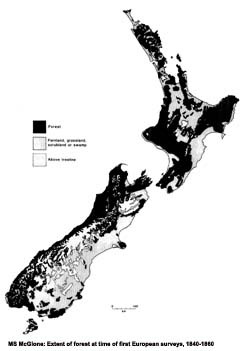 What was the natural state of the vegetative cover over New Zealand? Our vision of this is based on extant remnants of forest, charcoal in soils and alluvial deposits, pollen from lakes and bogs, macrofossil remains, subfossil logs, and soil surface forest dimples (MS McGlone1). There was a change in climate beginning about 7,000 years ago, with decreasing annual temperatures and a more continental climate that may have been caused by a general strengthening of atmospheric circulation. Widespread soil charcoal indicates that natural fire has been a recurring feature of the environment. In the South Island, there were at least six outbreaks between 2000 and 6500 years ago. Lightning strikes are the only likely sources of fire in most parts of the country as fire from volcanic eruptions only affects limited areas. Most of the forests of Central Otago and the McKenzie Basin were devastated by fire, along with areas in the mountain basins of South Canterbury. Other fires may have done similar damage as far north as North Cape. It seems that these fires did not result in permanent deforestation outside the inland Otago/South Canterbury regions. Even there, forest destruction was probably patchy, and predominantly confined to the drier valley bottoms and lower slopes. was not totally destroyed, and pollen analysis of a site close to eruption center showed that although the forests recovered quickly over 300 years, there was a change in the type of trees. More distant forests in the Waikato Basin, Bay of Plenty, and Hawkes Bay were also disturbed and burnt after the the Taupo eruption. As the pumice that fell in these areas must have been cold, foliage was most probably destroyed either by the ash fall, or by acids absorbed onto the ash particles and washed out of the eruption cloud by rain. Dead foliage and trees created ideal conditions for fires to start. McGlone concluded that despite speculation that volcanic eruptions destroyed forest and eliminated fauna, there is no evidence that they caused permanent deforestation except very close to the crater. Their primary influence has been to renew soils with ash and coarse alluvium. About 1,000 years ago, New Zealand received its first colonists. There can be no doubt that the first Maori to penetrate inland southeastern South Island discovered a landscape already partly in low scrub and grassland. About 80% of the country was still forested. Human-caused fires may have occurred on small scale 800 to 1000 years ago, based on a minor increase of charcoal and bracken spores at at some sites (McGlone1) . However, substantial additional deforestation can be detected throughout New Zealand beginning at around 400 to 800 years ago. Drier, fertile, lowland coastal sites were the first to be burnt extensively and little of the wet hill country was deforested. Some forest types, especially dry inland conifer broadleaved, were nearly eliminated and others, such as lowland matai-totara forests, were greatly reduced. Consequently, remaining forests are not at all representative of the pre-Maori situation. By 1500 AD the great lowland podocarp and beech forests of the eastern South island were gone. The evidence suggests that, at anyone site, deforestation proceeded rapidly once it had begun, and only rarely is there any evidence of regression back to forest. Major burning seemed to begin at roughly the same time throughout the country; initially, there was only sporadic and limited clearance, but 750 years ago began an onset of rapid, extensive deforestation. Maori were quite adept at fire. They made it in Boy Scout fashion, rubbing a pointed stick of kaikomako rapidly in a grooved piece of soft mahoe wood, with dried moss to catch the flame. William Colenso in his 1845 book Excursion in the Northern island of New Zealand described the practice of Maori making a small fire in the hollow at the base of a giant rata or rimu tree. It would continue to burn slowly for several weeks, as the heart wood was consumed and with smoke showing from the ends of the largest limbs at a height of 7 m. The leaves would remain green, apparently unaffected by the internal fire. He claimed this was done so that the Maori would save themselves the burden of carrying a European tinder box, and avoid the need to set another fire. The onset of human-caused burning coincided with a major extinction of bird species. It also began about 1,000 years , and has seen 30 species and sub-species being eliminated from the mainland. Deforestation due to fire may have contributed, particularly in drier, fertile lowland sites, and these were probably the most productive areas for bird life. A reasonable assumption from the distribution of kill sites is that the moa were concentrated in lowland areas of low to moderate rainfall and covered predominantly with conifer-broadleaved forest. The majority of, and the largest, moa kill sites are in the east of the South Island, mostly at or near the coastline. Lowland central Otago was also rich in sites. In the North Island, the major hunting sites were almost all at or near the coast, with few or insignificant kill sites in the mountainous, wet, central districts. Most of these optimum moa habitats were destroyed 500 to 1,000 years ago, suggesting that the moa were largely eliminated in this period. The kiore and dogs introduced by Maori may have contributed to the extinction of small ground-dwelling birds, but the consensus among archaeologists is that moa and other large ground-dwelling birds became extinct mainly because they were hunted by Maori. No moa became extinct during the period before humans arrived, and they became extinct in areas that were not burnt. The kill sites were abundant and widespread, and these birds were unlikely to have been severely affected by climate and vegetation change. Surviving bird species are mainly flighted, and those that are flightless are mostly nocturnal. Maori lifestyles underwent radical changes about 450 years ago. Older middens contained abundant bird, including moa, and marine mammal bone; the remains in the younger ones have mostly shellfish and fish remains. There was the onset of widespread building of pa (fortified villages) inthe North Island. The inference is that on colonisation, a rapidly growing population of Maori outstripped the initially easily-gathered resources, and began to use the land more intensively, mostly by clearing forest, cultivating crops and encouraging higher yielding vegetation. The appearance of pa may indicate that shortages of resources had become chronic, leading to conflict. By the time of widespread European settlement in the 1840s and 1850s, close to 50% of the original forest cover had been destroyed. 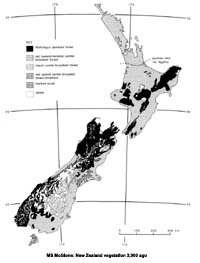 McGlone1 pointed out that there had been a marked reluctance to accept that settlement by Maori brought many environmental changes to New Zealand. He concluded that traditional Maori did practice resource conservation, but only within the context of a landscape they had already depleted, and where food shortages were an unpleasant common fact of life.